If you were given the opportunity to rewrite your country’s crimes, what would you do differently? And how would you cope with the consequences? DC Comics poses those questions in “Bombshells United,” a new comic series in the company's "Bombshells" universe scheduled to launch on Aug. 25. Written by Marguerite Bennett and illustrated by Marguerite Sauvage, the series takes place in an alternate 1940s reality where the events of World War II are tweaked, reshaped, or — in some instances — prevented from happening altogether thanks to a powerhouse team of well-known DC superheroines. “I know that I am a white woman, and this isn’t my story to tell. But this is a platform I was given, and not addressing this devastating stain on our history seemed irresponsible." The next story arc will focus on four young conspirators and their efforts to stop a train carrying Japanese Americans to an incarceration camp in Arizona after the signing of Executive Order 9066 by President Franklin D. Roosevelt in 1942. The “Bombshells” franchise began in 2013 with the release of a line of statuettes depicting characters like Wonder Woman, Harley Quinn, and Poison Ivy as 1940s-style pin-up girls. Artist Ant Lucia later designed a series of variant comic book covers that DC ran across their standard titles. The sculptures and covers received so much praise that the company decided to create a comic series featuring the heroines. Bennett, who’d written for DC titles including “Batgirl” and “Superman: Lois Lane” and expressed enthusiasm for the Bombshells, was asked to submit a 3-page pitch. She sent in 18 pages. “Bombshells” launched as a weekly digital series in August 2015. Originally intended to be released in 10-page increments and collected into a monthly 30-page single issue, the response was so positive that DC decided to “double ship” the series, producing two issues a month. The first series ran for 34 issues, requiring Bennett to pack five years’ worth of stories into two. The "Bombshells" comic book opens with Batwoman swooping down on Gotham City to save a young Bruce Wayne and his parents from an armed robber, giving the Wayne family a happy ending and establishing that the world of the Bombshells doesn’t need typical male heroes like Batman. The first run of the series follows Batwoman, Wonder Woman, Supergirl, and Aquawoman, among others, as they fulfill their respective roles in helping the Allied World War II efforts, from fighting Nazis to preventing the bombing of London. 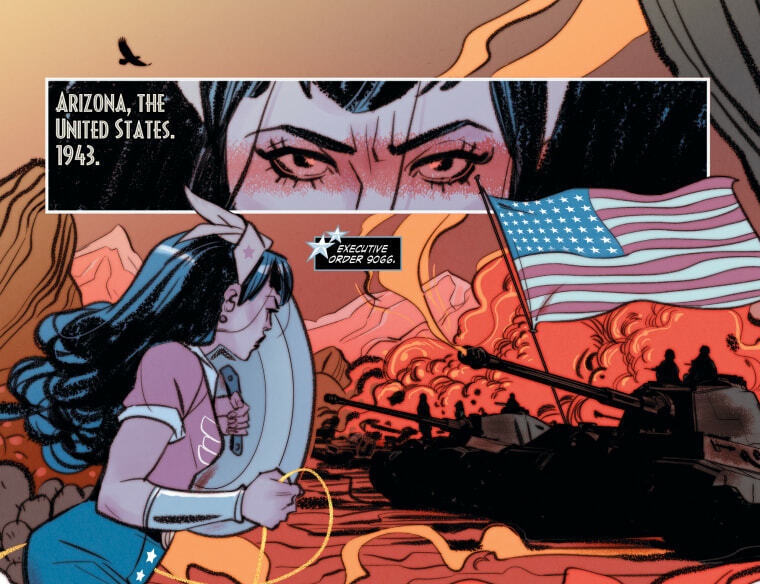 The relaunch introduces new Bombshells like Black Canary, Bumblebee, and Katana, and zeroes in on the battles raging at home, starting with the incarceration of Japanese Americans. Though Bennett is writing her own interpretation of history, much of the comic is based on real historical events, and Bennett spends hundreds of hours conducting research for each story arc, she said. In order to prepare for writing about Japanese-American incarceration, Bennett consulted a battery of books on the topic, including “Farewell to Manzanar” and “No-No Boy.” She also visited the Japanese American National Museum in Los Angeles and the Manzanar National Historic Site — an incarceration camp that has been turned into a memorial — several times to tour and interview volunteers. “I’m addicted to research, and I also wanted to be as respectful to this history as possible,” Bennett said. Bennett begins the story with four teenage Japanese-American girls — Donna, Cassie, Yuki, and Yuri — who stage a train heist to save their community from being taken to an incarceration camp. While Wonder Woman answers their call for help, bringing a score of giant eagles to carry passengers to safety, the girls are seen as the real heroes, the masterminds behind the plan, Bennett said. Home becomes an important theme in future chapters as the girls try to determine where that is and how to move on once they’ve reached it. Japanese-American community dynamics are also explored in the arc, specifically intergenerational struggles between the issei (first generation immigrants) and nisei (American-born second generation). Bennett plans on visiting every theater of the war in this run of “Bombshells,” from fascist Spain to the South Pacific, but all that, she said, depends on what the readers want.